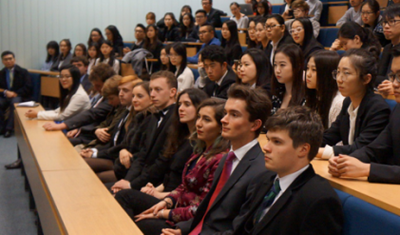 On 29 November, 2016, at the invitation of Durham Union Society, Minister Zhu Qin of the Chinese Embassy to the UK delivered a speech entitled "Accelerate the "China-UK Express" to 200 teachers and students at the lecture hall of Durham University. Minister Zhu Qin said that, despite the Brexit referendum, the fundamentals in China-UK relations remain unchanged with a solid foundation. The "Golden Era" of China-UK relations is a strategic consensus of both sides. It features "golden pillars" in high-level exchanges and dialogues, "golden fruits" of practical cooperation, "golden bonds" in people-to-people exchanges and cultural cooperation, and "golden example" in China-UK collaboration in world affairs. Minister Zhu Qin pointed out that, today's China-UK relations is like an express train. Political mutual trust is the locomotive, practical cooperation between China and the UK are the coaches, and China-UK collaboration on an international scale would lay the rails to enable this express train to run fast, steady and far. Minister Zhu Qin also answered questions from students on the development of China-UK, China-Europe and China-US relations, the interpretation by the Standing Committee of the National People' s Congress of Article 104 of the Basic Law of the Hong Kong Special Administrative Region of the People' s Republic of China, the Hinckley Point C nuclear power project, the RMB exchange rate and the DPRK nuclear issue. After the speech, Minister Zhu Qin visited Chinese scholars and students working and studying at Durham University. The Education Section of the Chinese Embassy in the UK and the Education Section of the Consulate General in Manchester were present. It is a real delight to visit the Durham University, the third oldest university in England and a member of the Russell Group, well known for its historic heritage and academic strength. To be honest, I am not good at debate. Every time I disagree and debate with my wife and son at home, I am always the first one to give in. Therefore, I have great respect for debaters and I find it such an honour to address the Durham Union Society, one of the most time-honoured student debate societies in Britain. "If you have never been to Durham, go there at once. Take my car. It's wonderful." Today, with great pleasure, I come to Durham, but of course, in my own car. There is an old Chinese saying, "Where you are from makes who you are." It is thus not difficult to understand that so many Durham graduates have become outstanding leaders in various aspects of the society. Durham University also has a long-time relationship with China. Here, the first lecturer in Chinese was appointed in 1952. The Centre for Contemporary Chinese Studies was established in 1999. The Durham University Library is one of the top British libraries with the most important collection of books on China. The Oriental Museum of Durham is famous for its extensive Chinese exhibits. On behalf of Ambassador Liu Xiaoming and the Chinese Embassy, I would like to start by extending my congratulations to Durham on your tremendous achievements in teaching, research and studies. I would also like to extend my thanks for your commitment and contribution to closer exchanges and cooperation with China. 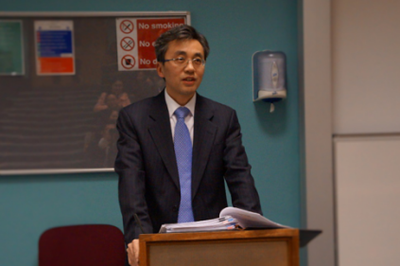 In 2012, Ambassador Liu delivered a speech here at Durham about "what kind of China-UK relationship do we need". I'm sure his views on growing ties between China the UK must have left many who were present on that day a deep impression. Four years on, great changes have taken place around the world. I don't think anyone could have been certain about Brexit and Trump's victory back at this time last year. Four years on, for China and the UK, huge progress has been achieved in our bilateral relations. Notably last October, President Xi Jinping paid a successful and historic state visit to the UK, which is a milestone in the history of our bilateral ties. During that visit, China and Britain agreed to build together the global comprehensive strategic partnership for the 21st century and unveiled the "Golden Era" of China-UK relations. Let me make the following four points to help shed light on the meaning and impact of this "Golden Era". First, high-level exchanges and dialogues between China and the UK have become the "golden pillars" of our relations. In September, President Xi and Prime Minister May met in Hangzhou. The two leaders reaffirmed the "Golden Era" and the shared commitment to take our global comprehensive strategic partnership to a higher level. Early this month, Vice Premier Ma Kai came to Britain and co-chaired with Chancellor Philip Hammond the eighth China-UK Economic and Financial Dialogue. The Dialogue produced 63 outcomes on cooperation in a wide range of areas such as trade, finance and infrastructure. Since the beginning of the year, our two countries have co-hosted the First China-UK High Level Security Dialogue, the First China-UK Regional Leaders Summit, the 12th meeting of the China-UK Joint Economic and Trade Commission and the ninth China-UK Leadership Forum. In December, more dialogues will take place, including the High Level People to People Dialogue, the Strategic Dialogue and the China-UK Asian Affairs Consultation. These high-level exchanges and dialogues are the solid pillars of the over-all bilateral ties between China and the UK. Second, China-UK business and financial cooperation are bearing more and more "golden fruits". In 2015, bilateral trade totaled 78.5 billion US dollars. China remained Britain's second largest trading partner outside Europe. Britain is home to more Chinese investment than any other European country. In recent years China has invested more in Britain than in Germany, France and Italy combined. So far, China's FDI stock in the UK has totaled nearly 17 billion US dollars. More than 500 Chinese companies have well settled down in the UK. Financial cooperation is another highlight. London is the global financial centre. It has witnessed a number of "firsts" in RMB internationalization. o In 2014, the British government issued the first RMB sovereign bond in London. o In 2015, China's central bank issued the first RMB denominated central bank bills in London. o And in June this year, China's Ministry of Finance issued three-year RMB sovereign bond worth of three billion yuan, the first of its kind outside China, again in London. Key infrastructure project is making progress. In September, China, UK and France signed a package deal of the Hinkley Point C nuclear project. This project is the single biggest investment that China has ever made in the UK and Europe. This project will create more than 20,000 jobs and provide reliable energy supply to millions of British families in many years to come. This flagship project marks a new phase of China-UK win-win cooperation. Third, people-to-people exchanges and cultural cooperation are the "golden bonds" between our two countries. Britain is now the largest destination in Europe for overseas Chinese students. Nearly 160,000 Chinese students study in this country. There are more Confucius Institutes and Classrooms in Britain than anywhere else in Europe. More than 600 primary and middle schools have started to teach Chinese. In China, more than 300 million people are learning English. Hundreds of millions are fans of the Premier League and British TV shows. I'm a fan of Downtown Abbey actually. There are now 56 pairs of sister-cities between our two countries. More than one million Chinese and Britons travel back and forth every year. That means every day nearly 3,000 trips are made between our two countries. The aviation authorities of our two countries signed an MOU to increase flight capacity between China and Britain. This will certainly boost tourism and trade. This year also marks the 400th anniversary of the passing of Tang Xianzu and William Shakespeare, the two literary giants of China and Britain. Our two countries co-hosted a number of commemorative cultural exchange events. Shakespeare's King Henry III, King Henry IV and the Merchant of Venice made great success in China. The General and the Prime Minister and the Legend of the White Snake, the two Peking Opera masterpieces graced the London stage and were proved a great hit with the British audience. Fourth, China-UK collaboration in world affairs set a "golden example". Both China and Britain are countries of global influence. For decades, our two countries have maintained close communication and cooperation at the UN Security Council, the G20 and other important international organizations. o And the Korean nuclear issue. China and the UK are also in the forefront in the response to global health challenges by strengthening cooperation on antimicrobial resistance. This June, China and the UK co-hosted the first High Level Security Dialogue in Beijing. This was a joint response to global security challenges, such as cross-border crime and cyber security. Our two countries agreed to strengthen bilateral security cooperation based on equality, mutual trust, sincerity and pragmatism. The Belt and Road Initiative, proposed by President Xi Jinping in 2013, is an important public product that China offers to the world. This is a vision of an economic belt that extends from the Asia-Pacific region in the east to Europe in the west. It will create growth for this vast region and the rest of the world. Britain is an important partner in the Belt and Road Initiative. There is huge untapped potential for China-UK cooperation. At present, China and the UK are working actively together to explore ways of cooperation in this ambitious initiative. What happened after the Brexit Referendum confirms one thing. That is, the vital interests binding our two countries together have remained unchanged. And the fundamentals of China-UK relationship have remained unchanged. The "Golden Era" is a strategic consensus between China and Britain based on long-term, deep and careful thinking. Building the "Golden Era" responds to the strong desire on both sides for closer exchanges and cooperation. Such strong, shared desire is the source of vitality of the "Golden Era". 200 years ago, George Stephenson built the world's first steam locomotives. His great invention unveiled the modern history of long-distance land transport. If I may compare today's China-UK relationship to an express train, then at the time of profound changes, what can we do in this "Golden Era" to ensure this express train of China-UK relations runs fast, steady and far? First, political mutual trust is the locomotive of the train. Deeper mutual trust means this train will have greater power and stronger momentum. China and the UK are different in social system. We are in different stages of development. We have different culture and traditions. It is inevitable, and only normal, that our two countries have different views and sometimes problems between us. The unveiling of the "Golden Era" does not mean that the differences and problems will automatically disappear. But the "Golden Era" requires us to approach whatever differences and problems we may have in a proper way. As the old Chinese saying goes, "Debate helps find the truth." We need open and in-depth communication and should stand in each other's shoes in order to expand consensus and remove misgivings and misunderstandings. "No two leaves are ever exactly alike." This western philosophical quote also makes a point. The world is beautiful not because everyone is the same, but because everyone is different, because nations are different from each other in social systems and cultures. Therefore, China and the UK should respect each other's social system and path of development. We need to respect each other's value and cultural traditions. And in particular we have to respect each other's core interests and major concerns. We need to strengthen high-level exchanges and political dialogues. We also need to consolidate people-to-people bonds through education, culture, media, tourism, sports, etc. We need to make continuous efforts to expand the friendship and exchanges between our two peoples. Support from the people is crucial to the building of the "Golden Era". Second, the practical cooperation between China and the UK are the coaches of the train. The more the coaches and cargoes, the more productively this train will run. China and the UK are respectively the second and fifth largest economies in the world. We have much to offer to each other in trade, investment, finance and science and technology. There is huge potential for cooperation in new energy, urbanization and public-private partnership. Prime Minister May seeks a government that "works for everyone". She has proposed a more balanced industrial strategy and a vision for a Global Britain. These have much in common with China's Belt and Road Initiative and 13th Five Year Plan. By dovetailing our respective development strategies, China and the UK can deliver more benefits to our people than we each can do separately. That's what I call "one plus one can be greater than two". After the Brexit Referendum, many Chinese companies have cast a vote of confidence for Britain with their concrete actions. oTianjin Airlines opened a direct flight route connecting Tianjin, Chongqing and London. oHuawei UK announced that it will go ahead with its planned 1.3 billion-pound investment in the UK. oSichuan Guodong Construction Group announced its plan to invest 220 million pounds in housing projects in Sheffield over the next three years. oChina Gezhouba Group expressed an interest in the UK's water conservancy projects, to the tune of roughly a billion pounds. oLast week, Chinese tourism group Ctrip brought the Scotland-based flight-search company Skyscanner for 1.4 billion pounds. I look forward to even stronger business cooperation between China and the UK in the "Golden Era". Third, China-UK collaboration on an international scale will lay the rails for China-UK express train to reach the farthest corners of the world. And this will enable our bilateral ties to be truly global. China and the UK are both permanent members of the UN Security Council and important members of the G20. It is obvious that China-UK relationship goes far beyond the bilateral scope. In the "Golden Era", this global dimension of our bilateral relations will continue to unfold. In the coming five years, China's import will reach eight trillion US dollars. China will attract 600 billion foreign investment and make 750 billion outbound investment. Chinese nationals will make over 700 million visits outside China. China will stay committed to the strategy of open development and win-win cooperation. These huge opportunities mentioned above means China and the UK can leverage our respective strengths and jointly lead global and regional agenda. China and the UK should continue to adopt a global vision and expand international cooperation. We need to work together to advance reforms of the global economic governance and strengthen cooperation in sustainable development, anti-terrorism, anti-corruption, antimicrobial resistance and peacekeeping. We will therefore contribute our part to world peace, stability and prosperity. 2017 will mark the 45th anniversary of the establishment of the ambassadorial-level diplomatic ties between China and the UK. The past four decades and more have been an extraordinary journey for China-UK relations. Looking forward, we need to ensure that our relationship in the "Golden Era", like an express train, moves forward with a powerful locomotive, with fully loaded coaches and on rails reaching far and wide. It takes wider participation, concerted efforts and continuous innovation from both countries to deliver more benefits to the people of our two countries and beyond. A university is a place for ideas to interact, evolve and be refined. It is a place for young people to grow. Young people, like most of you present today, are the hope and future. You are the ones who will shape the future of China-UK relations. I look to greater achievement by Durham Union Society and wish everyone present today greater success in the years ahead. I also hope you will take a greater interest in promoting China-UK friendship and cooperation. Let's work together to build the bridges and lay the rails for the great China-UK express train!